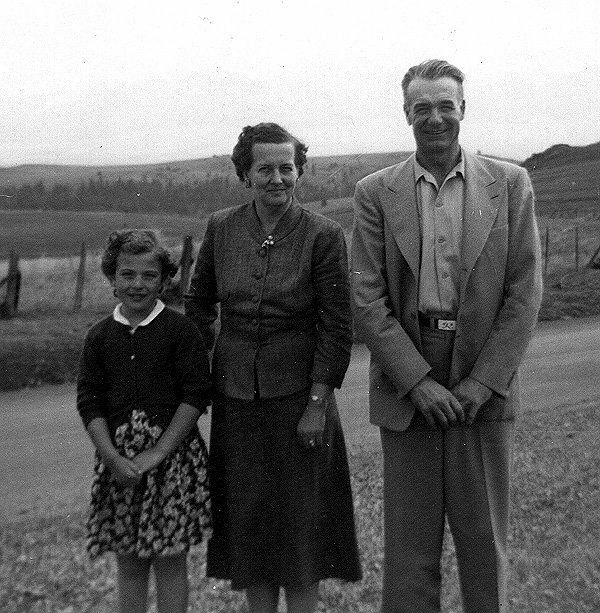 Shirley Rushing with her parents, Billie Jean and Shade, in Seneca about the time they moved to the Bear Valley Lodge in 1953. 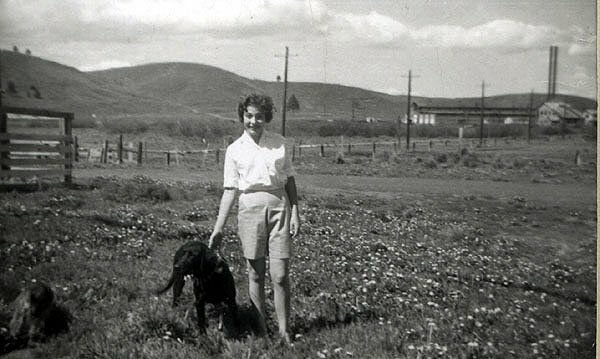 Shirley Rushing with her dog, King, behind the Bear Valley Lodge in Seneca, with the shop in the background, 1960. Few girls can say they grew up in a rooming house for loggers. In 1953, when Harrison was 7, she and her parents moved to the Bear Valley Lodge in Seneca, which was built by Edward Hines Lumber Company to provide housing for its loggers. Her mother, Billie, managed the rooming house while her father, Shade, worked as a master machinist for the Hines Company. The loggers who lived at the lodge, which Harrison said they called a hotel, were all single men. She and her parents had a separate two-bedroom apartment of their own at one end of the lodge. While such living arrangements might seem unusual for a young girl, Harrison said she actually wasn’t around the men very much and, over all the years there, never experienced an uneasy moment. “All the men who lived there were very hardworking and mannerly,” Harrison said. Harrison said the men who roomed there ate their meals in a cookhouse. She recalls her mom washed all the sheets in the basement and handled all the paperwork. Her father enjoyed his supervisory position, which allowed him to work indoors. During the holiday season, they made sure there was a big Christmas tree in the lodge’s lobby, Harrison said. She added her mother had a green thumb and even had a knack for getting geraniums to bloom during Seneca’s bitter cold winters. When the Hines ceased logging operations in 1962, Harrison’s parents bought the lodge building and continued to live in it. Harrison attended Seneca School through eighth grade and then Grant Union High School, graduating in 1964. She lived at the lodge until she was 21, when she moved out to attend school in Portland. Her mother lived at the lodge until 1969. Harrison, who lives in the Portland area with her husband, Jerry, reflects fondly on her growing up years in Seneca. In fact, it was there where she and Jerry met – in the third grade. She loves telling people about her years living at the Bear Valley Lodge. “I would have to say I had the perfect childhood,” Harrison said.